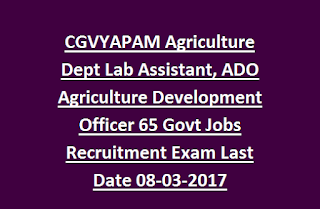 State Agriculture Department through a combined recruitment of Competitive Examination. Total number of vacancies available in CG VYAPAM Lab Assistant recruitment is 55 and ADO is 11 Govt Jobs. Interested candidates with fulfilling eligibility criteria can apply online through Chhattisgarh state vyapam official website @ cgvyapam.choice.gov.in. Online applications are available from 17-February-2017 till 08-March-2017 before 05.00 Pm for this CG VYAPAM Lab Assistant Jobs Recruitment. CG VYAPAM Lab Assistant and ADO Jobs recruitment vacancies will be filled up through a competitive examination and written test conducted by the Cg Vyapam Selection board. Written exam date and centers are given below. Available vacancies, age limits, Salary, Educational qualifications and other details regarding Chhattisgarh State Public Examination Board CGVYAPAM Lab Assistant Jobs and ADO Recruitment examination are given below. Click here to download the official notification of CGVYAPAM ADO, Lab Assistant Jobs Recruitment. Online registration starting date: 17-02-2017. Closing date for online registration: 08-03-2017. Written test date: 26-March-2017 (Sunday). Exam Centres: Ambikapur, Bilaspur, Durg, Jagdalpur, raipur. 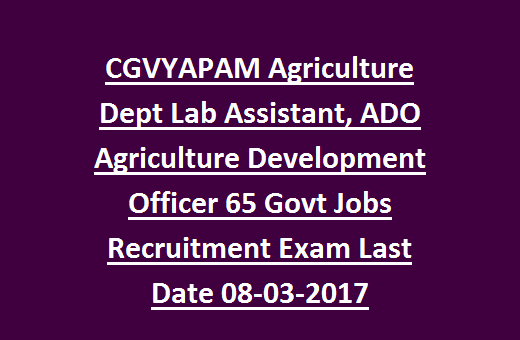 There are total 65 posts are going to fill through this CGVYAPAM PSC Lab Assistant Jobs Recruitment Competitive Exam 2017. Monthly Pay scale for the Lab Assistant vacancy is Rs.5200/- to 20200/- +GP as per Government rules. For ADO Jobs must have completed Agriculture Engineering/Bio Technology/Horticulture from Agriculture University. For more qualification details see the CG VYAPAM official notification given below. The candidate's age limits as on 01-January-2017 is 21 years to 35 years for CG state candidates and for other upper age limit is 30 years. Age relaxations will be applicable for the women and reserved candidates as per the Chhattisgarh state Government. Selection for this Chhattisgarh CGPSC Lab Assistant Jobs Recruitment will be held in two stages. Written test will be conducted in 2 parts for 150 marks and consists of 300 questions. The time duration will be given as 180 Minutes. Merit list will be prepared on merit basis of written test and only those candidates will be called for the personal Interview. 1. Basic concepts of Chemistry & Structure of Atom. 2. Classification of Elements & Periodicity in properties, Chemical bonding and Molecular Structure. 3. States of Matter, Thermodynamics, Equilibrium. 4. Redox Reactions. s-Block, p-Block, d-Block, f-Block elements. 5. Organic Chemistry - Basic Principles & techniques. 6. Physical Chemistry - Basic Principles & techniques. 7. Inorganic Chemistry - Basic Principles & techniques. 8. Chemical Kinetics. 9. Solutions. 10. Acids & Bases. 11. Chemistry in Everyday Life. Application fee for General candidates is Rs. 350/- and for OBC candidates Rs.250/-. For SC/ST/ PWD candidates Rs.200/-. Interested/ Eligible Candidates can apply online through the official website of CGVYAPAM @ cgvyapam.choice.gov.in. Read the Uploading procedure from the notification and start filling the application. Upload photo & signature along with filled application form from 17-February-2017 to 08-march-2017.